It took me a while to figure out the best way to use this delightful little substance, so I thought I give you some the tips for using Masquepen that I have found useful. I use Masquepen exclusively to mask-out text in my altered books. It comes out of the bottle as a pale blue liquid that feels like rubber cement when it dries. I cover the words or phrases with the Masquepen, and after it dries, I am able to do art work over the page without worrying about obscuring the text. You can see some examples of this process in my altered book, A Cup of Sky and also in Dreams and Delights. Test your paper first to make sure that the dried Masquepen doesn’t lift the text ink from the page when it’s removed. 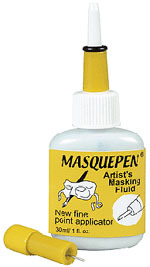 If you find that that the Masquepen removes the text ink from the page, lay down a thin coating of fluid acrylic medium to the page before using the Masquepen. This will protect the text and paper when you’re removing the Masquepen coating. If you have drawn any pencil marks on the page, erase them before applying the acrylic medium. You can’t remove them after the medium has been applied. 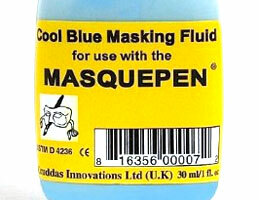 Try not to squeeze the Masquepen bottle while applying the coating. You want to avoid getting air bubbles in the Masquepen. They are very annoying. Let the Masquepen flow slowly out of the bottle. I spread a tiny bit of Masquepen on scratch paper before applying it to the book page to get rid of any bubbles that might be on the surface of the Masquepen in the bottle. Keep a straight pin handy for popping bubbles that might appear in the Masquepen when it hits the page. Keep a toothpick ready to scrap any Masquepen that strays from where you want it to go. I also use the toothpick to drag the Masquepen into places that I can’t quite get to with the Masquepen bottle tip. Let the Masquepen dry until translucent before doing any kind of art work on top of it. The Masquepen takes quite a bit of abuse, but I still advise using a gentle touch when going over it with your brushes or water color crayons. I use my fingers and tweezers to lift the Masquepen off the page when I’m done painting. It’s fun to try and take it all off in one piece, but it’s certainly not necessary. If you decide to use a paintbrush to apply the Masquepen, realize that you probably won’t be able to use the paintbrush for anything else afterwards. Also, look in good art stores by the watercolor paints.